Welcome back to another year of hockey and practice plans. If there is someone in your association or with your team that you would like added to the list please let me know that. This season, I will be doing practice plans that will be implemented for the 13U & 14U Bantam age group. You will notice that some drills within some plans are labeled with a direction for the coach who is in charge of that specific drill but the explanation has little if any explanation. The reason for this is simply that I am fortunate to work with some very good coaches who have an expertise in certain areas of skill development and/or positional play and I allow them quite a bit of freedom when coaching their particular station. 2) Full Ice (1 team of 15 skaters & 2 goaltenders) in a full ice single team setting. -Last year at 12U Pee Wee I tried to keep the focus on not using any ‘pattern’ or ‘scripted’ drills’ in order to give the players the freedom of making their own passing and skating decisions when in a drill. This year at Bantam, the focus is going to be on the drills to not only be unscripted but also for the ‘team play’ drills to all begin from a hockey playing situation and end in a scrimmage with no pre-set ending point except to keep the work/rest ratio appropriate. 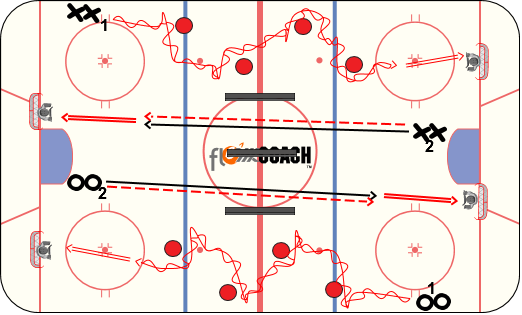 3) Small Area Games (2 teams of 16 skaters & 2 goalies for a total 32 skaters & 4 goaltenders) sharing the ice in a half-ice format with the half-ice boards along the red line. Each team will be broken up into two team to compete in small area games with and without set parameters to allow both for the opportunity of free play and to create a transitional game environment with a net to defend and a net to attack. Please note that all the plans will be repeated in consecutive weeks and not all plan formats will be done every week in light of holidays, days off, etc.